Painthouse, a contemporary brand of toxin-free paint, makes its debut at the London Design Festival in a colourful collaboration with London-based artist, Lois O’Hara, interiors retailer, W.A.Green and German design brand, pulpo. 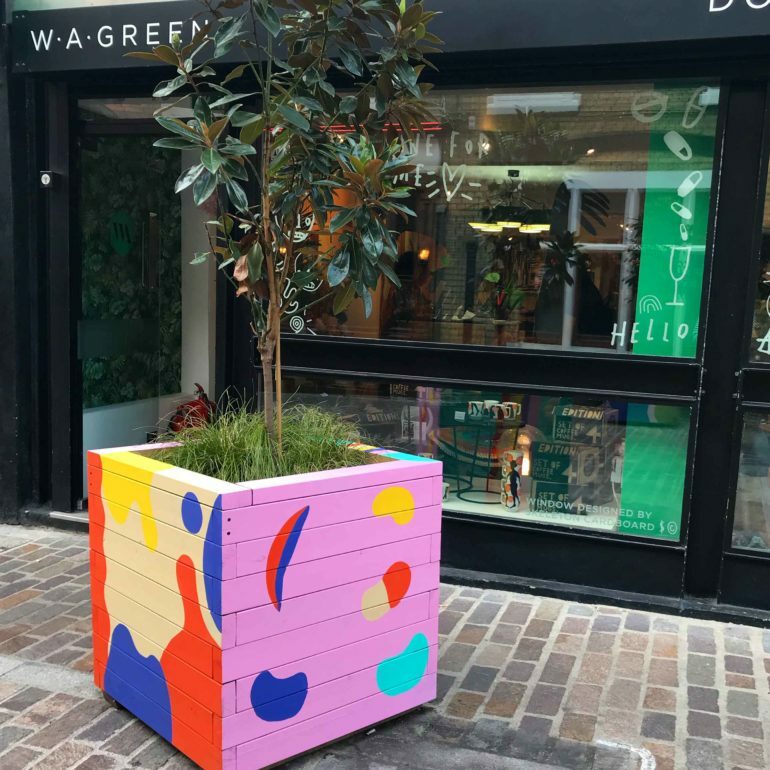 In a bid to brighten the streets of Shoreditch and ‘calm’ traffic in low-emission zones, 6 large wooden street planters will be transformed into brilliantly bold and colourful art installations, thanks to the hugely talented artist Lois O’Hara. Adding to the drama, a further installation from Lois will feature in the display window of ‘dopamine-for-the-home’ interiors retailer W.A.Green, where design brand pulpo also exhibits its most colourful, fun and eclectic products to date. Known for her love of bold colour combinations, Lois O’Hara curated an edit of 6 Painthouse colours for the uplifting art installation of the window and planters along Charlotte Road and Rivington Street in Shoreditch. Lois’s work is renowned for being visually stunning, bright and contagious, and it is hoped that passers-by will slow down or stop to take in the view. Hackney Council has given its full approval of the project and the team at W.A.Green is now in discussions to make this a longer-term community project. LoisO’Hara selected fiery REGGIE, cheery SEREN, fabulous AVERY, luminescent NORA, ultra-violet AKSEL, and nutty HAZEL from Painthouse’s 2018 debut collection of 72 lust-worthy paint colours for the project. With personality and names to suit (chosen using an eclectic mix of Norwegian and English heritage) narrowing the vibrant choice down to just 6 colours would have been no small task. Head to W.A.Green on 9-10 Charlotte Road, EC2A 3DH throughout London Design Festival 15th – 23rd September 2018 to see the result. Colour lovers can download Painthouse’s PEEL & STICK™ COLOUR BOOK or get it posted free – head to painthouse.co.uk and get excited about colour. 6th Edition EWPC, Exploring the Indian Wedding Market and fostering exciting business relations! Copyright 2019 FABUK Magazine. All RIGHTS RESERVED.